Some people describe Midtown as the center of Nashville’s nightlife, the place where locals come to unwind at the end of the day. A bit more laid-back than its neighbor, Downtown, with its dozens of tourist attractions, walkable Midtown is the place where residents meet friends, take dates, and enjoy some of the finest food and drinks in the city. Midtown is made up of a mixture of historic homes, new construction, and condominium buildings that are mostly within walking distance of its many entertainment venues. The campuses of Vanderbilt University and the Vanderbilt University Medical Center take up a large portion of the southern half of Midtown, and Downtown is just next door on the other side of Interstate 40. For this reason, many busy professionals choose to call the Midtown area home because the commute is nonexistent. 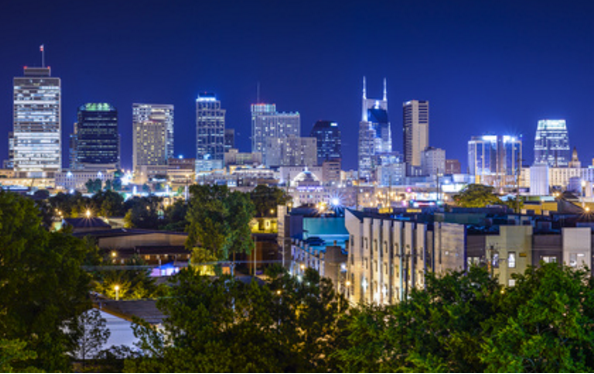 Many of Nashville’s top attractions are just minutes from the neighborhood, including the Country Music Hall of Fame and Museum, Bridgestone Arena, Nissan Stadium, Music Row, and the Ryman Auditorium. Restaurants and bars top the list of things to do in Midtown. The Broadway Brewhouse is open daily until 3 a.m. and offers nearly 200 different types of beer, including over 70 on tap. Losers is another late-night favorite hangout where you can catch NFL games on Sundays, or you can head next door to Winners for karaoke. The Patterson House feels like an old speakeasy and features over 50 cocktails on the menu. Tavern serves cocktails and standard pub food in an upscale environment. If you just want to grab a meal, there are plenty of places to do that, too. For authentic home-cooked food and live music, try The Row. Enjoy a slice or entire pizza pie at Two Boots or Soulshine. The Slider House serves nothing but gourmet sliders, ranging from hotdogs to lobster to black bean burgers. For upscale dining, the seven-course menu at The Catbird Seat is popular with locals, while Midtown Café is the place to go for something a little more laid-back and casual. Hattie B’s Hot Chicken is a Nashville staple with its Southern sides and spicy chicken, as is South Street, a Cajun restaurant that serves huge portions of barbecue and seafood. Café Coco is a popular 24-hour coffee house. Midtown is home to two art galleries: Midtown Gallery and Local Color. It is also home to Fly South, a sought-after shop for outdoorsmen looking to purchase fly fishing gear. Sports fans can take in a college baseball game at Hawkins Field, a basketball game at the Memorial Gymnasium, or a football game at Vanderbilt Stadium, all of which are located in Midtown. Nashville’s most notable park is also located in Midtown. The 132-acre Centennial Park is home to the iconic Parthenon, a walking trail, an arts center, historic monuments, an activity center, Lake Watauga, gardens, a band shell, volleyball courts, an exercise trail, and more. It is a popular spot for festivals and other events throughout the year. Centennial Park is also noteworthy because of its dog park, a space where locals can let their furriest family members run without a leash. The Parthenon is replica of the building of the same name in Ancient Greece. It was built in 1897 as part of Tennessee’s Centennial Exposition, and today it serves as the city’s premier gallery and art museum. Because many single professionals live in Midtown, you will find an array of condominium buildings in the neighborhood. Adelicia is a prime example. The 18-story building features 10-foot ceilings, floor-to-ceiling glass windows, private balconies and terraces, hardwood floors, top-of-the-line appliances, garden tubs, walk-in closets, a rooftop pool, a fitness center, ground-level retail shops, 24-hour security, and its own dog-friendly park. You will also find a selection of single-family homes in Midtown that typically start in the high $200,000s to well over $1 million. Some new construction is available, as are several well-preserved and renovated 20th century homes in styles such as Queen Anne, cottage, and bungalow. No matter where you choose to live, whether it is in a brand new condo or an established bungalow, you will find yourself within walking distance of some of the city’s top hotspots.